Realme just introduced itself to its rivals after it was named as the hottest selling smartphone brand at Lazada’s 11.11 Shopping Festival in Southeast Asia. Realme enjoyed the top spot, while Samsung, Xiaomi, Apple, and Huawei followed its lead, respectively. In case you missed it, Realme broke its sales in Indonesia, as it sold 40,000 units in just 20 minutes. The Realme 2, C1, 2 Pro were also named as the three top selling smartphones during the said period. 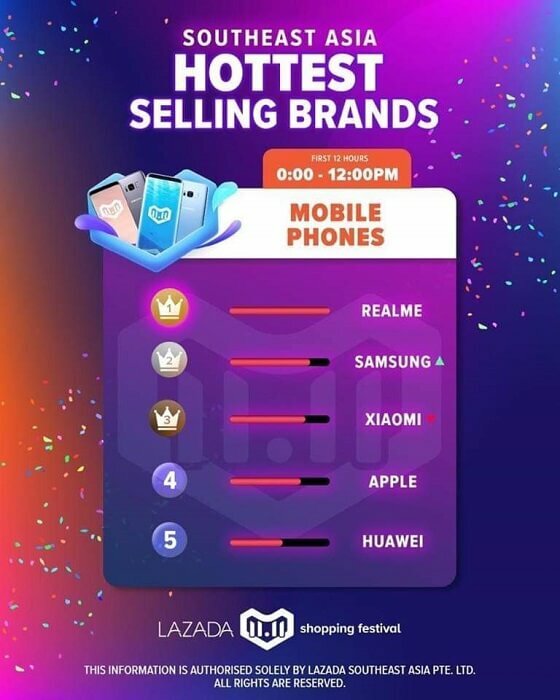 In the Philippines, Xiaomi claimed the top spot. The Chinese mobile manufacturer was followed by Huawei, Samsung, Apple, and Honor. See Also: Realme 2 Now Official; Better than the OPPO A3s? Meanwhile, Realme isn’t available in the country at the moment, but the company already teased its arrival in the local shores. Many fans are also expecting that its new Realme 2, 2 Pro, and C1 will land in the country to mark the brand’s local launch. Realme recently made its social media pages go live in the Philippines, too. Having strong online sales in Southeast Asia, it seems like Realme is a real deal, isn’t it?